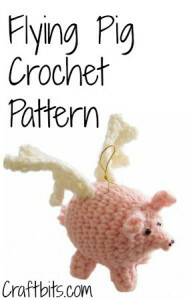 Pigs really can fly, at least in the world of amigurumi. This is a cute ornament for the Christmas tree, a baby mobile, or as a cute toy for the toddlers to play with. You will need a worsted weight yarn, an F crochet hook, beads, filling and a small elastic for hanging.